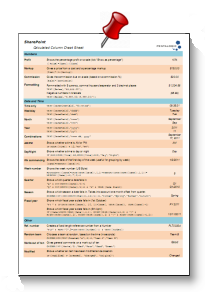 There are many instances where you might want to view a set of SharePoint list records which have been filtered on a comparison between values in 2 columns. You might want to view a list of all sales reps who have failed to hit their targets: Actual SalesCredit Limit, or employees who have not used their full vacation entitlement: Vacation Entitlement>Days taken. They use a SharePoint list to keep track of orders waiting to be manufactured and delivered – so amongst other fields they have Scheduled Delivery Date (which they have promised to a customer) and the Estimated Delivery Date which is kept up to date with the latest estimate. Most of the time the two agree but sometimes for various reasons the delivery date slips. Sounded pretty simple to me and I confidently told them how they could do it – just setup a new view with a filter to only show those records where Scheduled Delivery Date is greater than Estimated Delivery Date. This will happen any time you are trying to setup a SharePoint view filter to compare one field to another. The workaround is to use a calculated column to compare the field – then filter on the comparison. The key part of the formula is the [Scheduled Delivery Date]-[Estimated Delivery Date]. 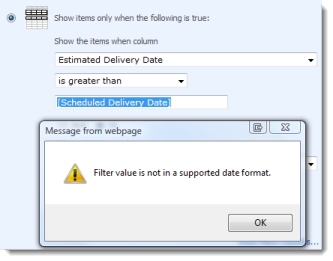 The IF and ISBLANK stop the calculation being performed for empty date values – otherwise SharePoint will assume 1st Jan 1900 and show values like 40,000 days early! The next step is to setup a new view for Delayed Orders and set the filter to only show items when the Days Late column is greater than 0. You may also want to filter out those deliveries that have already happened – you can do this by adding Status is not equal to completed or “Actual Delivery date is ” or whatever works with our data. For a bonus point I told them how they could setup a Reminder Web Part that would watch this view and send out automated emails to the account manager (or even directly to the customer) when an orders delivery date slips – you can even set it up so that if date slips again another email is sent. You can use this technique when you are comparing other type of fields in SharePoint such as Numeric or Currency or even text based fields – First use a calculated field for the comparison then filter on the result of the calculated field. You can’t use this type of technique for showing the number of days between a date and [Today] – not even with the infamous fake Today column trick because it doesn’t work. But you can use Today in the filter part so you can use filters for view such as tasks that are due in the next 7 days or overdue by 7 days or more. I need help with a dynamic filter on a list. I have a list of facilities that contains a day of week column. Each facility is in the list multiple times to report information by day (Building 1 Monday, Building 1 Tuesday, Building 2 Monday, etc). What I would like is for the view to figure out what day of the week Today is, then filter on that day of week column in my list. 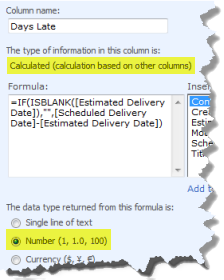 The day of week column can be either a text column or a numeric column if either makes the task simpler. I just can’t figure out how to do it.